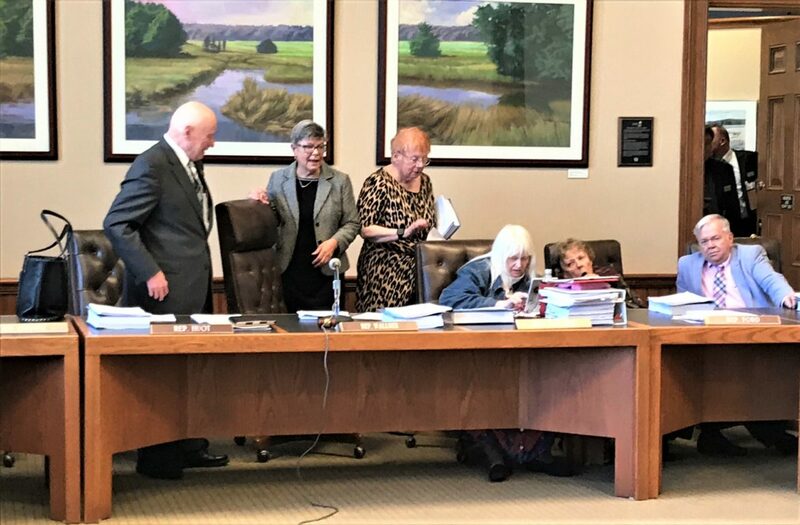 House Finance Committee members, left to right, vice chair Rep. David Huot, D-Laconia; chair Mary Jane Wallner, D-Concord; Lynne Ober, R-Hudson; Kathy Rogers, D-Concord; Susan Ford, D-Easton, and William Hatch, D-Gorham, talk as they finished their work on a proposed $5.4 billion state operating budget plan for the next two fiscal years. CONCORD — On a party line vote Wednesday, the House Finance Committee approved its proposed two-year operating budget sending it to the House floor for a vote next week. The House’s budget spends about $300 million more than the $5.1 billion budget proposed by Gov. Chris Sununu with much of the additional money spent on education. The House budget would appear to steer the Democratically controlled legislature on a collision course with the Republican governor as it includes a new capital gains tax, halts reductions in business tax rates, eliminates a new secure psychiatric unit facility, and does away with more than $100 million in one-time spending for new and renovated Health and Human Services facilities, projects that benefit a couple dozen communities and victims of a financial fraud case that occurred a decade ago. Sununu believes lawmakers should not use a more than $100 million surplus for programs that may not be sustainable if state revenues decline due to economic conditions and has made the new secure psychiatric unit facility a priority – holding a press conference Tuesday to make his point. And Sununu has repeatedly said he will not accept any new taxes in the budget and called the halt in scheduled business tax rate reductions a tax increase. House Finance Committee chair Rep. Mary Jane Wallner, D-Concord, said her committee crafted a budget that works for the whole state. Sununu’s budget proposal eliminated the Education Trust Fund which was established 20 years ago to address two Supreme Court decisions on the Claremont education lawsuit. Most years the trust fund does not produce enough money and is supplemented with general fund money, but for the past few fiscal years the fund has had a surplus. The fund is expected to have between a $65 million and $80 million surplus at the end of this fiscal year. The House budget increases spending on the state’s share of education aid to schools by more than $164 million in the next two years and includes a commission to study the current education funding system and the cost of an adequate education today. The increase in state education aid would be paid through a capital gains tax projected to produce about $150 million by the second year of the biennium. The House Finance Committee plan would spend the additional money by reestablishing fiscal capacity disparity grants to school districts that struggle to pay for education. The disparity grants would be awarded based on the amount of property value per student in a community. The House also increased state aid for the number of students on the free and reduced lunch program aimed at helping poorer communities. Committee members say the education funding proposal is an interim plan to help poor schools until a new plan is developed through the commission’s work. The House budget does not include the new $26 million building on New Hampshire Hospital grounds to replace the Secure Psychiatric Unit at the men’s prison in Concord that Sununu touted in his budget address and at a press conference Tuesday at Concord Hospital to blast the committee’s decision. Instead, the committee wants to appoint an advisory committee to develop a plan to transition the patients from the state prison to a new facility. “New Hampshire families have waited over 20 years for a solution and it is unconscionable that House Democratic leadership is now telling them that it is ‘too soon’ to move forward with this solution,” Sununu said earlier this week. * Create 40 transitional housing beds to help address the backlog of people with severe mental health issues waiting in hospital emergency rooms for a bed to open at the state hospital or community mental health program. * Early intervention programs to treat mental illness. * A mobile crisis team for children and youth. * The House budget adds a dental benefit to the state Medicaid program, costing $2.5 million for the last six months of the next biennium. * Committee members said the six months will give budget writers in the next legislature information to determine what the program would cost in the future. The committee also wants to increase staff for child protection, to increase services for at-risk families and additional funding for prevention. Other provisions would bring the state into compliance with the federal Families First Act and allow the state to collect a 50/50 match for services now fully funded by the state. The House budget substitutes a legislative family and medical leave plan approved by both the House and Senate for the governor’s proposal for state workers in New Hampshire and Vermont. Sununu had proposed putting $15 million in the state’s rainy day fund, bringing the total to a record $137 million, but the House plan would put $5 million in the state’s savings account. But the House did adopt most of the governor’s plan for sports betting. The House Finance Committee approved both House Bill 1 and House Bill 2 on a series of 13-9 votes down party lines and without debate.